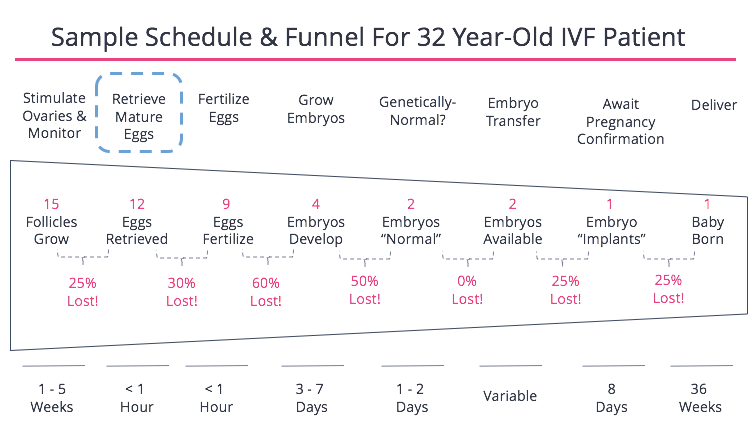 IVF can look like a factory process because it involves multiple steps that happen in a very specific order, and after each step we have less “material” (in this case eggs or embryos) to work with. 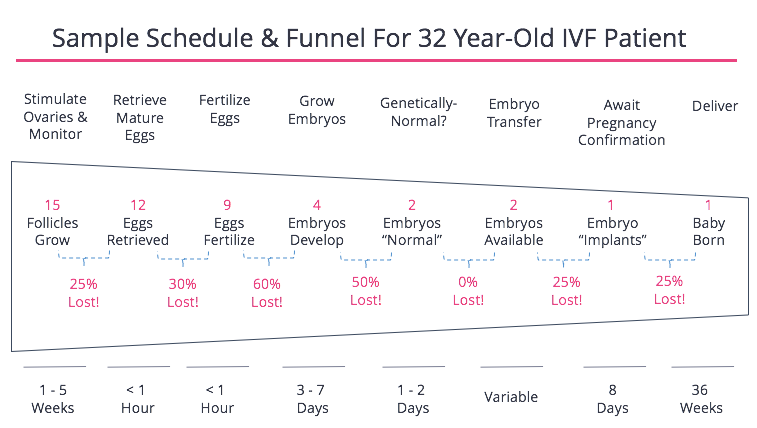 To illustrate the point, we’ve outlined how this process might look for a 32-year-old woman who’s had a successful IVF cycle. It’s worth noting that for many women and couples, the number of eggs or embryos after each step may not look this good. 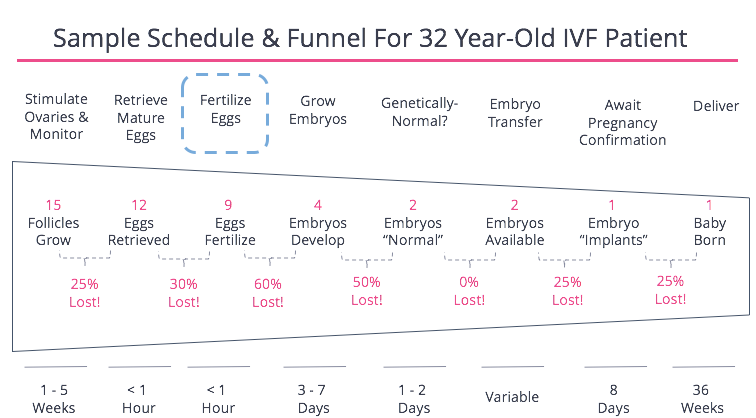 During each step of the IVF process, a doctor and patient can make decisions to help ensure that more eggs or embryos are available, raising the odds the IVF cycle leads to a healthy delivery (and perhaps allowing for the creation and storage of additional embryos that can be used to have more children later). 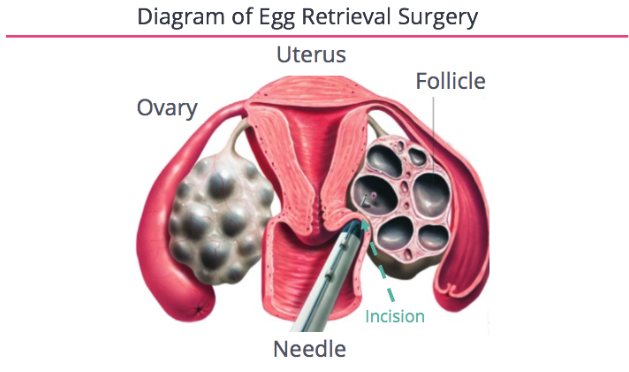 During the ovarian stimulation phase, most women inject themselves with hormones that directly act on the ovaries to grow a large number of follicles, each of which houses an egg. Generally speaking, the “stimulation and monitoring” period lasts about 10 days for most women. We love the dataset below of 38,000 IVF patients which shows that, yes, producing more eggs drives more live births, but only up to a point. 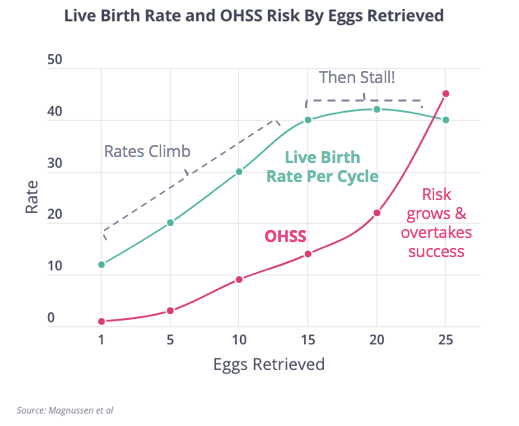 Once a woman produces about 15 - 20 eggs in a cycle, her odds of having a birth from that cycle stop increasing. But what does increase is the odds she hyperstimulates and develops ovarian hyperstimulation syndrome, or OHSS. OHSS is excruciatingly painful and in some case can be dangerous. Additionally, taking higher doses of drugs costs more money. Beyond a certain point, at best that extra expense is “money down the drain” because it doesn’t improve the odds of having a child. At worst, it imperils a woman’s health by raising the odds she hyperstimulates. During this time the patient returns to the doctor’s office on up to a daily basis to have her blood drawn, and ultrasounds taken, to chart how many follicles are growing and to adjust dosing. When a doctor is satisfied with the number and size of the follicles, the patient will take a drug to forces the eggs to “mature.” Thirty-six hours later a fertility doctor will use a small needle to pierce through the vaginal wall to access the ovaries. At the end of that needle is a small vacuum that drains the follicles and retrieves the eggs. As you can see from the depiction below, this a surgical procedure associated with pain and recovery time. Many women are surprised to learn that they end up with fewer eggs retrieved than the number of follicles that were growing. That’s because only about 75% of large follicles produce a “mature” egg. One decision to consider is whether the doctor should try and drain smaller follicles to see if they may hold mature eggs, though they’re unlikely they to. And again, after a certain number of mature eggs (~15 - 20) are retrieved, the data shows that success rates don’t improve. The data below on egg freezers from NYU treated from 2007 to 2014 illustrates an important point: the number of mature eggs retrieved tends to decrease with age. However, we wouldn’t focus too long on the specific numbers in the Y-axis because these are egg freezers, and they haven’t experienced trouble conceiving, so they may be more fertile than women doing IVF. Once mature eggs are retrieved, they need to be placed in a petri dish and fertilized with sperm. The major decision at this point is the technique your clinic’s laboratory uses to fertilize the eggs. Conventional Insemination involves surrounding the eggs with washed sperm. Intracytoplasmic Sperm Injection, or ICSI, involves injecting sperm directly into the egg. You need to ensure your doctor & clinic don’t just put this decision on “auto-pilot.” As you can see below in the nationally-reported data, nearly all patients end up having their eggs fertilized with ICSI, whether it’s needed or not. 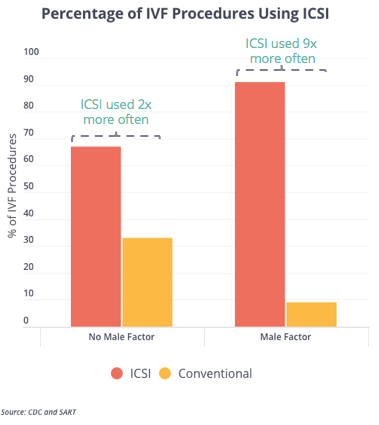 This matters because while ICSI is clearly helpful for some types of patients (and often has higher fertilization rates than Conventional Insemination), in many patients the data shows it drives no higher rate of success (and in some types of patients it correlates with lower rates of success). However, ICSI does cost an additional $1,500 - 3,000 and there is still conflicting data on any impact it has on the resulting offspring. Once an egg has been fertilized, the laboratory must establish the right environment (temperature, oxygen tension, humidity, temperature, nourishment) for it to develop into an embryo hearty enough to implant in the uterus. This is the hardest step for a clinic to perform and, as you can see in the green circle above, this is where the most eggs and embryos are lost in the IVF process. We tell patients that this is the step where exceptional clinics seperate themselves. A fundamental question at this point in the process is whether the embryos should be grown to the “cleavage stage” of development (4 - 10 cells and often synonymous with being grown to “Day 3”) or to “blastocyst stage” of development (at least 50 - 100 cells and often synonymous with being grown to “Day 5 or 6”). This decision is influenced by a number of factors that include a woman’s age, whether her embryos previously stopped developing in a previous IVF cycle after the cleavage stage, whether she wants to chromosomally test the embryos (if so, growing to blastocyst stage is better) or freeze the embryos for a later transfer (blastocyst stage is also better). Ideally, what should not determine this decision is whether the clinic is even capable of growing embryos to the blastocyst stage. You must ensure your clinic is able to grow embryos into blastocysts and that can be measured by the clinic’s “blastocyst conversion rate.” You want to see a blastocyst conversion rate above 40% and preferable closer to 50% or above. An embryo must have the correct number of chromosomes (known as a “euploid” embryo) for it to implant in the uterus and lead to the birth of a healthy baby. 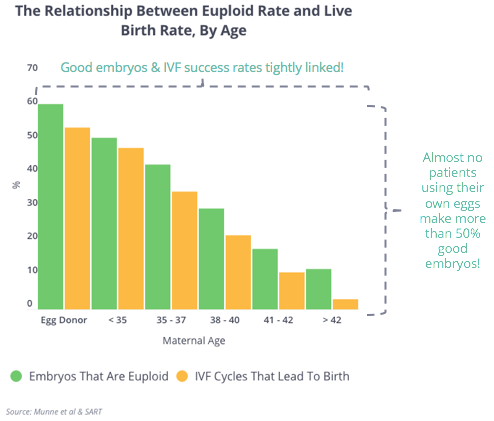 As you can see above, we also put a green circle around the numbers lost here because so few embryos meet this criteria. 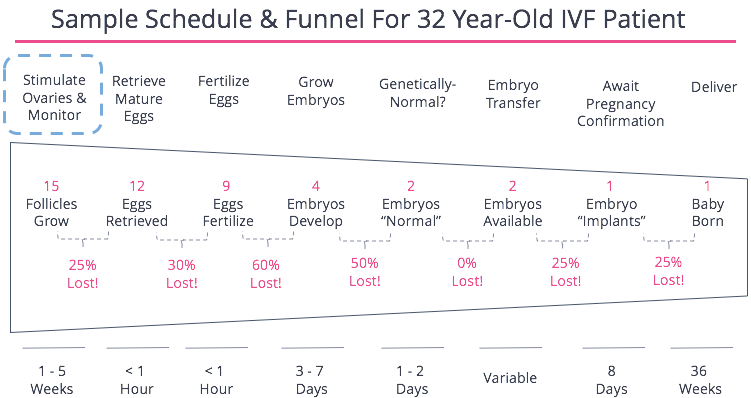 We went ahead and took data on the percentage of chromosomally normal embryos developed at over 40+ clinics, broke it down by patient age, and compared it to national IVF success rates. You’ll see two facts emerge. First, there is a tight correlation between the percentage of chromosomally normal embryos patients make and the odds their IVF cycle works. Having chromosomally normal embryos is crucial to having a live birth. Second, and this is also important, even the youngest, healthiest patients produce mostly chromosomally-abnormal embryos. This is a primary reason many IVF cycles fail and certainly why most transfers fail. Knowing whether you’re transferring chromosomally-normal, or abnormal, embryos can help prevents failed transfers and miscarriages. 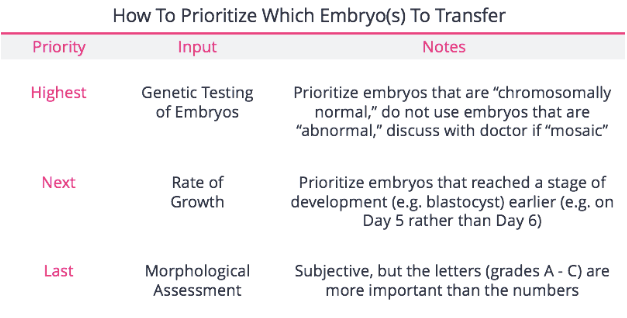 This begets a major decision at this stage: does it make sense to spend money on a test (known as PGS, PGT-A or CCS) to determine if the embryos are chromosomally normal? 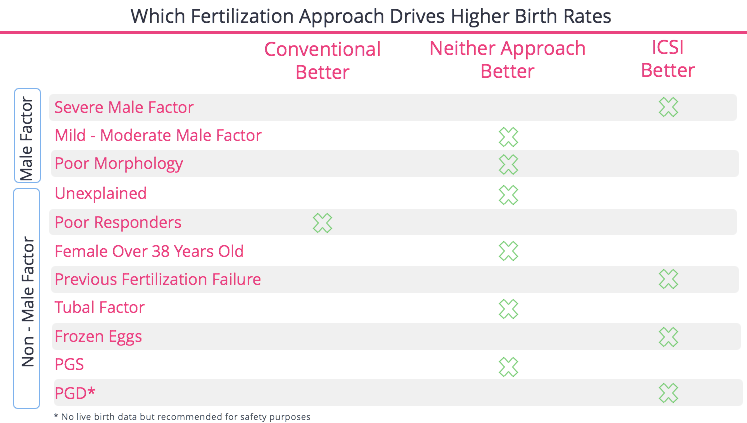 Just as with fertilization techniques, many clinics take a “one-size-fits-all” approach and either have most, or practically none, of their patients get this test. As a patient, you need to ensure the clinic is not making these decisions on auto-pilot. To the positive, these tests can help your doctor select the best embryo for transfer, thereby helping to avoid failed transfers that may end in miscarriage. In addition, these tests can offer useful information about embryos that a woman or couple may freeze for future use. If these embryos are chromosomally abnormal, they’re highly unlikely to lead to a live birth and the patient shouldn’t rely upon them to deliver more children. 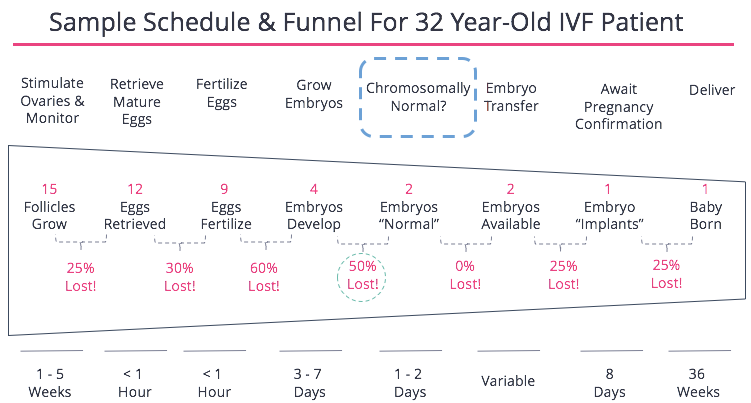 To the negative, these tests cost an additional $5,000 and they don’t change the underlying quality of a patient’s embryos, and thus don’t change the odds any given IVF cycle will work. 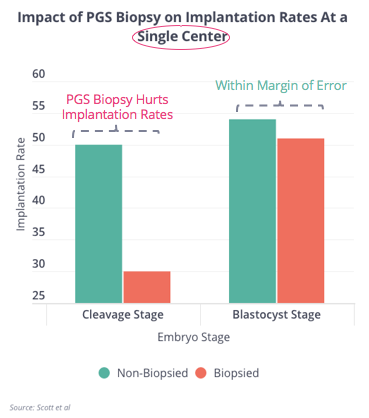 If you think you want to have your embryos genetically tested, you will want to have your embryos grown to the blastocyst stage of development and here’s why: one clinic showed the biopsy needed for this test clearly hurts success rates on cleavage stage embryos but not necessarily on blastocyst stage embryos. The data is below. 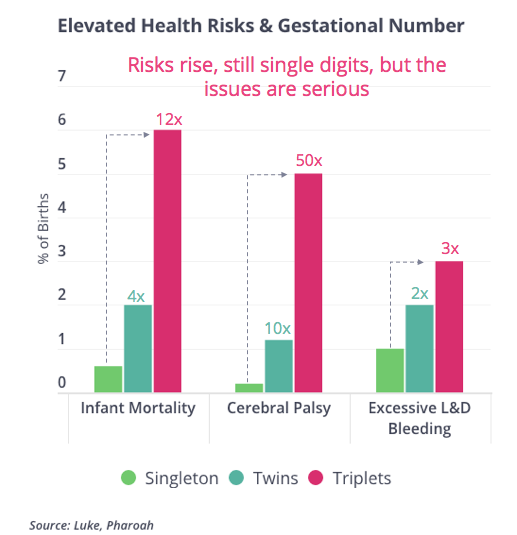 Yet, this data comes to us from just one center (and so it may not be generalizable to all, or even most, centers) and it only looks at the implantation rate and not live birth rate. So the data is not superb, but on balance it probably demonstrates testing is safer on a more mature embryo. First is whether to transfer “fresh” embryos only a few days after the retrieval or to freeze all of the embryos and thaw a few down the road for a transfer at a later date. 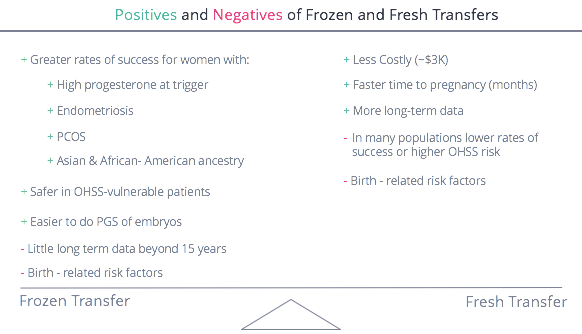 The decision to freeze all embryos and delay the transfer clearly improves success rates for certain patients (like women with high progesterone levels at the time of trigger) and decreases risk of hyperstimulation in others (like women with PCOS). In addition, it alleviates a lot of logistical complexity if a someone wants to genetically-test their embryos. However, some doctors are reluctant to push all patients to freeze all their embryos because they would like to see more long-term data on how freezing and thawing embryos effects the offspring. 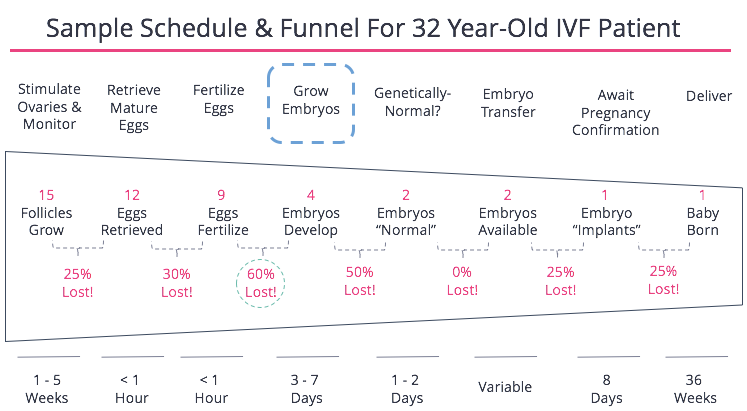 Similarly, some patients prefer to have their embryos transferred immediately because they’re understandably fatigued by the process, want to know as soon as possible if the cycle worked, and may bristle at the higher expense associated with freezing all their embryos and preparing for a later transfer. Next, the patient must decide how many embryos to transfer at once. 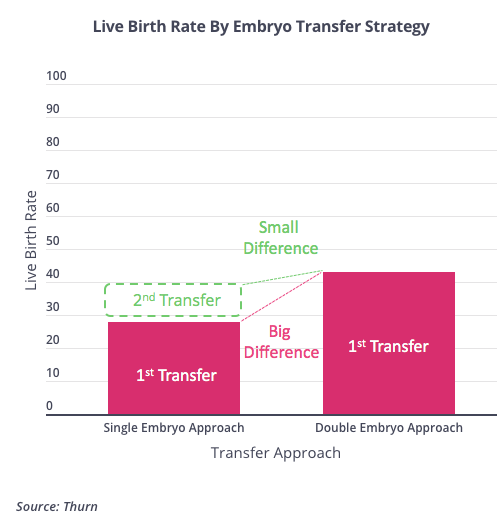 As you can see can see in the data below from a large Swedish population, if a woman has two embryos available for transfer, if she transfers both at once she has a higher likelihood that transfer will work than if she transferred just one. 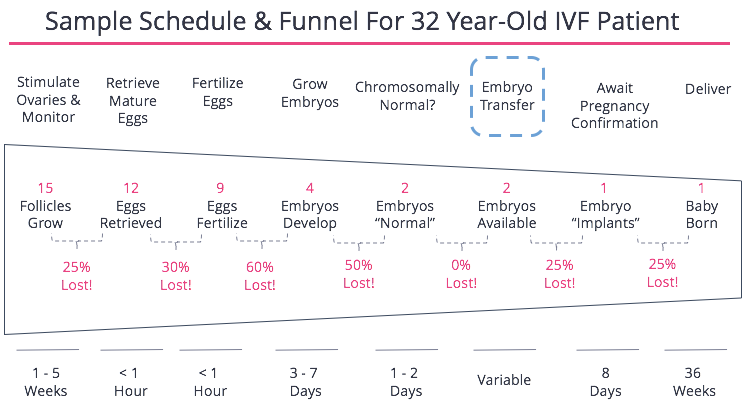 However, if that “single embryo transfer” fails and the second embryo is then transferred, the cumulative odds of success are practically the same. 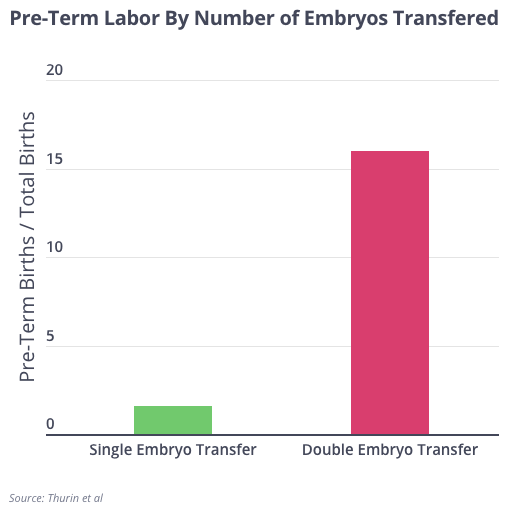 So why not just transfer both embryos at once? The reason is that transferring multiple embryos raises the risk multiple pregnancies occur at once. Below we compile the best studies showing the issues that come up with multiple-gestation pregnancies and you’ll notice three things: (1) each additional fetus raises the risk to mother and child, (2) and though the incidence of risk is still in the single-digit percentage range (3) the issues we’re discussing couldn’t be any more grave (for example, infant mortality) and so any increased risk is cause for concern. In the US, most patients still have multiple embryos transferred at once and that is often at the doctor’s suggestion. Given the trade-offs, this is a decision patients need to weigh early in the process. Once an embryo has been transferred into the uterus, it must implant in the uterine wall to continue developing. About 75% of chromosomally normal embryos implant. Eight days after the transfer, women return to their clinic to see to see if their hCG levels are rising. If the hCG number is above zero, it means a pregnancy has taken hold. If the rate of hCG continues to climb, depending on the rate, it reflects an increased odds the pregnancy will be viable. Women are often told that a doubling of hCG levels every two days indicates a viable pregnancy, but we’ve yet to find the study that reflects this and doctors tell us that they often see women who did not have “doubling betas” continue to remain pregnant and deliver. If a woman received a “positive beta,” the odds she delivers a baby are about 70% to 80% (higher for younger women, lower for older women). 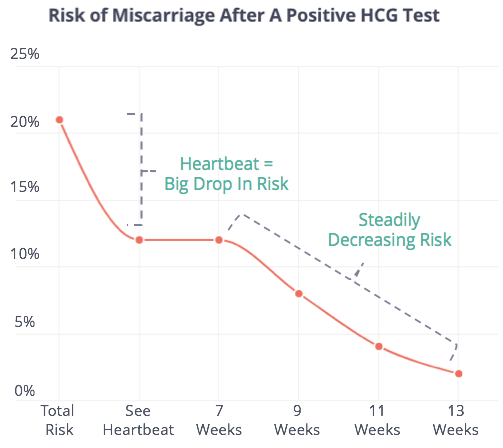 One well-run study looked at how the odds of a delivery varied after every weekly milestone and, as you can see, by the time the doctor can see a fetal heartbeat, the risk of miscarriage dramatically falls and steadily decreases with each passing week. 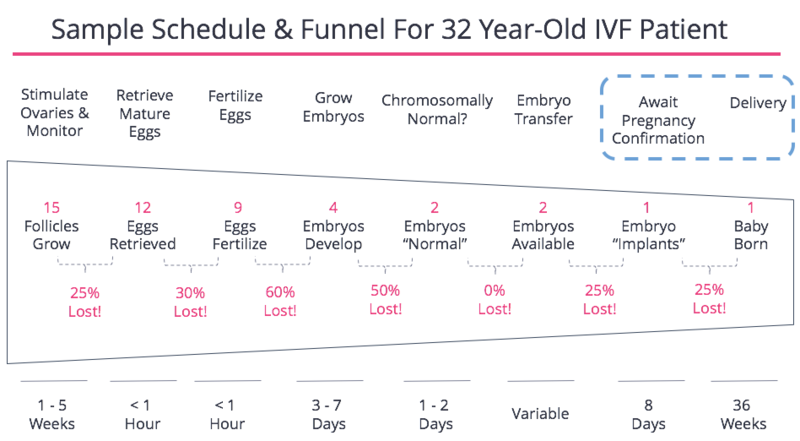 Ultimately, most IVF births make it to term, but the reality is that those involving a multiple embryo transfer are far less likely to reach term.